New video contest for WAGNER big PIZZA! After the school years, an era known for self-discovery andfreedom, comes a time where young people enter an age of responsibility, where conforming to new norms is crucial. During this transition, true ‘buddyship’ moments are hugely important. Whether it’s about perpetuating old traditions in a new environment, or creating new ones, this is what young people live for. 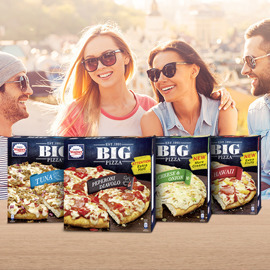 WAGNER Big Pizza is a brand young Germans like because it’s accessible, easy and accompanies them during their adventures with their buddies. WAGNER Big Pizza would like to share videos that start a real conversation with young Germans - for whom legendary after-hours ‘buddyship’ moments keep them sane. Create an entertaining, fun and surprising video that celebrates an intense & memorable ‘buddyship’ story young Germans would want to share with their friends. Format: video or animation- ideal length 30 to 45 sec.